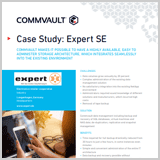 To make data handling more agile, flexible, simpler and faster, Expert SE, a trade group for consumer electronics were looking for a new, powerful data management solution. In particular, this should speed up the backup processes. The whitepaper introduces the solution: a software data management including backup and recovery of SQL databases, virtual machines and NAS data; deduplication, replication and snapshot management. – Why should an enterprise consider Sectigo Certificate Manager? When it comes to certificate management, there can be confusion between Microsoft CA (MSCA) and Sectigo certificate management. What's the difference? And why should an enterprise consider Sectigo Certificate Manager (SCM)? Eric Rux and Ken Galvin discussed solutions to Chromebook and networked device management challenges.